This sky map of Venus and the moon shows how they will appear at about 6:30 a.m. ET on Feb. 28, 2011 to the U.S. East Coast. Observers in other parts of the U.S. may see a similar sight at around the same time, weather permitting. Early risers will be treated to a striking celestial sight early next week as the two brightest objects in the night sky — the moon and Venus — will appear near to each other. Venus and the moon will appear in low in the east-southeast sky on Monday and Tuesday (Feb. 28 and March 1). For U.S. skywatchers, they will rise over the horizon at around 4:30 a.m. local time and should be in a good position to be viewed about 60 to 90 minutes later in the brightening dawn. This sky map of Venus and the moon show how they will appear during their morning appearances next week. Keep in mind that your clenched fist held at arm's length measures roughly 10 degrees in width. So on Tuesday, the moon and Venus should appear separated by less than half a fist. If you plan to arise early to view this eye-catching pair, make sure that you do not have any obstructions like trees or buildings in your way, as they will be situated rather low in the sky. Venus is now rising around the start of morning twilight. Although it's only about half as bright as it was during greatest brilliancy last December, it's still an impressive sight as it comes up in the east-southeast. Venus rises about 2 hours before the sun on Tuesday, March 1, but that will shrink to only about 80 minutes on March 31. Although unmistakably bright, it's rather low in the dawn sky. 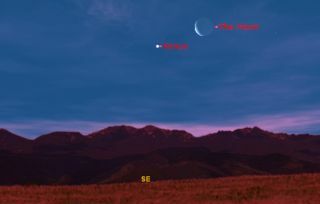 At sunrise in early March Venus is less than 20 degrees high as seen from locations around 40 degrees north latitude, and each week it sinks a bit lower. Venus moves from Sagittarius into Capricornus on March 2. As it passes across the stars of Capricornus, we'll have our last opportunity until December to observe the planet against a dark and starry background. With binoculars, watch it pass 4 degrees south of star Beta Capricorni on March 5 and 0.7 degrees north of the star Theta on March 13. Venus will enter the faint constellation of Aquarius on March 25. Between mid-March and the end of this year, Venus will make a complete trip around the zodiac. A telescope will reveal its gibbous shape. The brilliant planet is now fleeing ahead of Earth in its race around the sun. But its 22 miles per second (35 kilometers per second) motion is only slightly faster than Earth's 19 mps (30 kps). This year Venus takes about seven months to pass behind the sun as seen from our moving platform in space.